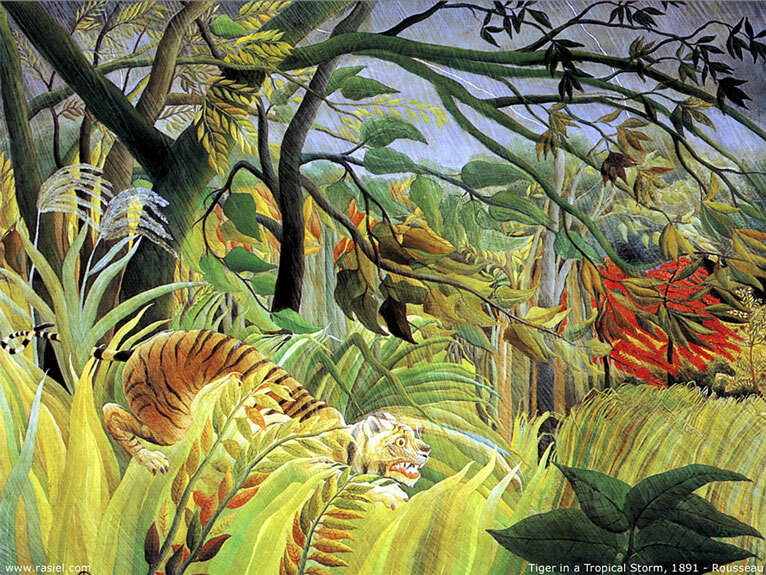 This is one of Rousseau’s most famous paintings – “Tiger in a Tropical Storm.” Rousseau’s paintings pack a big emotional wallop. You feel the fear, the desperation of the tiger. The white light on the top of the tiger’s head and on the nearby leaves shows the light of a lighting bolt that is alarming him. You feel sympathy for the tiger – and yet, you also feel the tiger is a monster that could eat you. All this can be referenced and pointed to in intellectual terms, in words such as these. Beyond that is the vast and deep emotional content of the work, which can only be appreciated through the use of your emotional ability. Do you feel it?